Opinion Festival 2016: Why Am I Volunteering at the Opinion Festival? Because it’s Fun! In the spring of 2015, I had the honour of participating in the course held by Liis Kängsepp, the then-Communication Manager of the Opinion Festival, at Tallinn University. As an overly-excited first year journalism student I kept my eyes and ears open for possible internship jobs for the coming summer. Then, all of a sudden, Liis mentioned that the Opinion Festival was looking for communications volunteers. By the time I got from Tallinn University to Telliskivi Street by tram, I had made my decision. When I got off the tram, I was sure that I could become a volunteer at the Opinion Festival. To be fair, I didn’t know too much about the Opinion Festival back then − sure, I was aware of the festiv al’s presence in the media, but I hadn’t even been to Paide that much before, let alone participated in the festival. So it was time to open my mailbox and write an email to Liis. And so, one fine day I found myself in the Opinion Festival’s Communications team, informing readers about all kinds of exciting discussion topics, people and events that together form the Opinion Festival. It was a fun time. I could make my contribution to one of the coolest events in Estonia by writing up stories and doing interviews over the whole summer. Whether at 6 am on the coach to Tartu or fending off flies in the afternoon sun on Saaremaa, I could help with putting together the big picture of the festival by writing pieces on the festival blog. And then came August and the festival. I remember sitting in the Opinion Festival’s Press Centre finalising another one of my pre-festival articles and through the open window, I could hear people adjusting the mics all over the place and the tech guys making a racket on the balconies while installing the internet. Excitement and thrill filled the air − just like prior to a birthday party when the table is already set but the guests haven’t arrived yet. We weren’t able to enjoy that peace and quiet for too long though, because the guests began to arrive. Thousands of them. 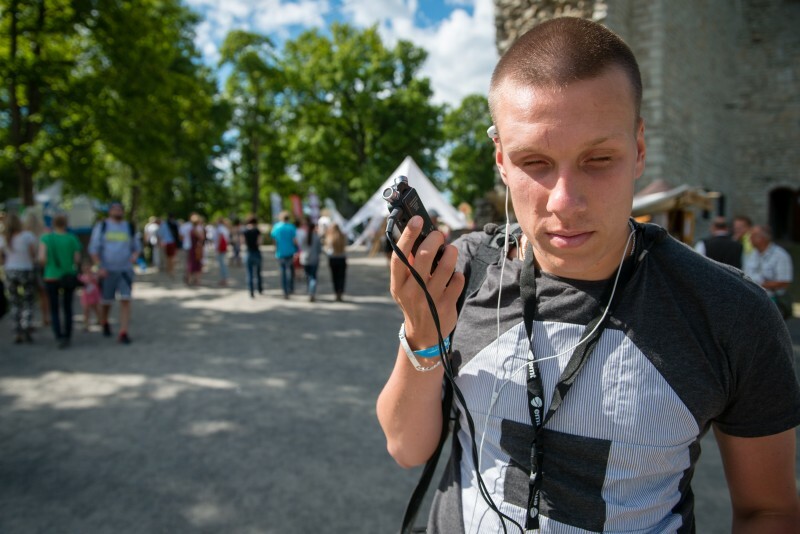 Eight, nine, ten thousand people gathered in Paide to take part in the festival’s discussions. Yes, these two festival days were rather mental and now when I think about them, I remember the ceaseless chatter, sitting on the grass with my legs crossed and the keyboard, which I was devotedly tapping for 12 hours on a trot. Down the stairs to the discussions and up the stairs to write. Down the stairs to the discussions and… Until all of a sudden it was the evening of the second day and I found myself sitting on the ground and braiding grass rings; the dark and soft August night was flowing past me with its overheard conversations, gales of laughter and good ideas. I was thinking to myself, “Wow! So cool!” And that feeling has stayed with me ever since. And that’s exactly why three months later I sent another email saying that I wanted to help out and work on the Opinion Festival in 2016 as well. This year the festival will be even bigger, even more diverse and even more fun. That’s why the team and I are already in full swing to make the festival happen. There are many great, fun and exciting things on the way. So stay tuned and see you all in Paide!